It isn’t often we come across an overlap shed that offers more durability than Shiplap. 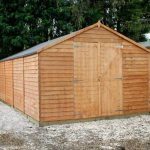 However, thanks to the strong pressure treatment applied to the timber, this spacious shed comes with a 15 year anti-rot guarantee. What’s even more impressive however is the fact it doesn’t require any treatments. So if low maintenance is high on your list of priorities, this is definitely a model you will want to consider. Described as a security shed, the building comes with wide double doors and no windows. The lack of windows gives the shed a very secure and private design. So if you have anything valuable that you need to store, you can rest assured it will be safely out of view. Traditional overlap is used which gives the shed a rough, rustic design. This is the stronger type of overlap and it offers a reliable structure whilst helping to keep the cost of the shed down. The doors are kept fully closed via an included pad bolt. This also gives you the option to secure them with a padlock. As a padlock isn’t included you will need to buy one separately. 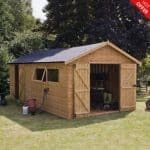 Overall this is a great value shed with many unique advantages compared to other overlap models. Though it does have a range of impressive benefits, this isn’t the most attractive shed on the market. However a quick coat or two of a coloured treatment is all it needs to provide a more stylish look. 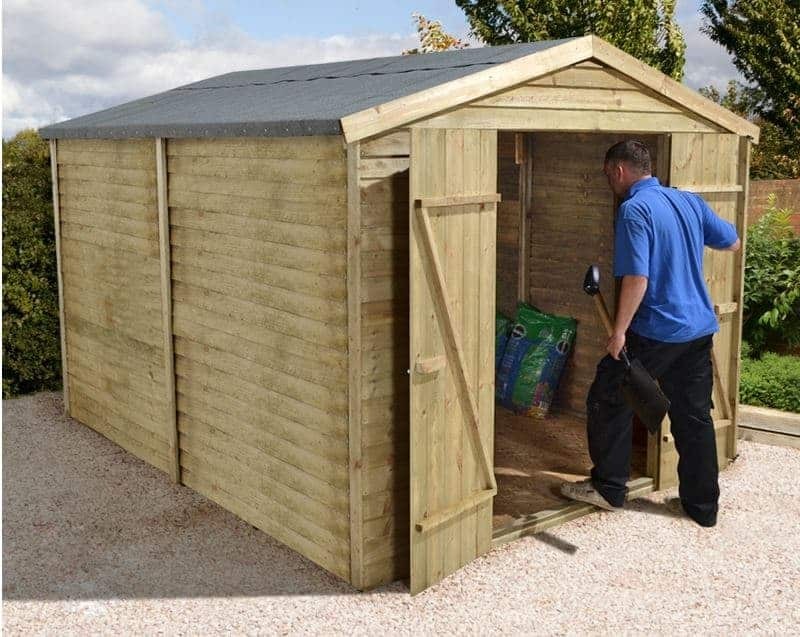 This is a very strong overlap security shed, designed to hold anything from gardening tools and equipment to garden furniture and bicycles. The most significant measurement on this shed is its height. It is one of the tallest buildings on the market and this makes it ideal if you’re a little on the taller side. Obviously you want a shed of this size that you can comfortably use; especially if you plan on spending a lot of time in here. Even the door height is slightly above average height. The extra tall height of this shed is credited to the apex roof. Built from OSB, the roof is highly weather resistant. It is covered by a simplistic felt that offers adequate rot resistance. However, as it is a fairly basic felt type, it means it likely won’t last as long as the cladding. Therefore you may wish to invest in a better quality felt. You can find different types online and we’d particularly recommend the fibreglass variety as these will not perish when exposed to the elements. The floor is constructed from MFP. This is a little stronger than OSB so compared to other overlap buildings, this does benefit from a slightly better quality. 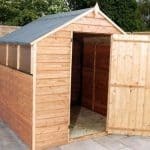 If you’re hoping to store anything significantly heavy however, or if you want to use the building as a workshop, we’d still recommend making a few alterations such as adding an extra solid wood sheet or bracing. 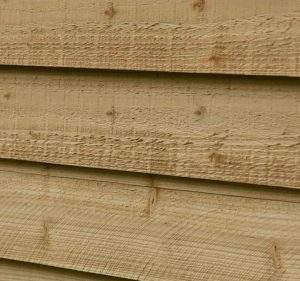 You may not know this, but there are actually several types of overlap cladding. Some are better quality than others and Shed Store have made sure to use the highest quality type on this shed. Traditional square cut overlap forms a strong, reliable structure that when treated, is highly resistant to even the harshest weather conditions. A 45mm x 28mm frame is also used on the interior. This is thicker and therefore more stable and durable than standard framing found in the majority of overlap sheds. Typically, overlap needs a lot of maintenance to ensure it doesn’t warp throughout the changing seasons. 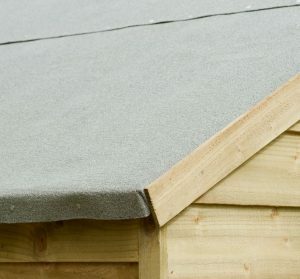 However, as this shed has been pressure treated it is completely weatherproof; so much so that it doesn’t need to be treated like other overlap sheds do. Pressure treatments are much stronger than basecoat and dip treatments. 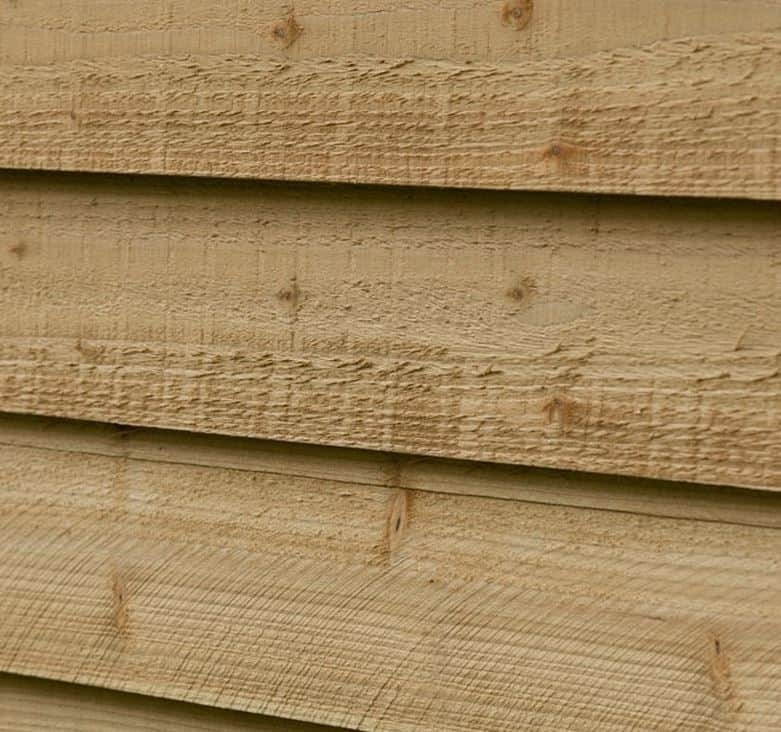 What sets it apart is the fact the preservative the timber is dipped into doesn’t just soak onto the surface, it is also pressured through to the inner layers of the timber to form a strong internal barrier. This is why it requires no annual treatments. It also contributes towards the fantastic 15 year anti-rot guarantee supplied with the shed. We’re especially impressed by the doors of this shed. Not only do you benefit from a spacious, wide entry, but the double doors are also braced. This ensures even if you use the shed several times a day, the doors will not sag through overuse like some cheaper, unbraced doors do. Shed Store have also added both a pad bolt and a turn button catch so there’s no chance at all that the doors will open on their own accord. There aren’t any windows which is largely why the shed is advertised as a security shed. It allows you to store anything valuable without fear of potential thieves seeing it and being tempted to break in. 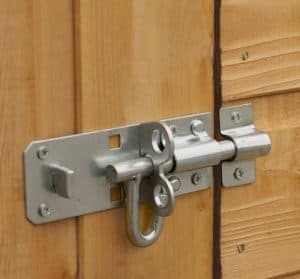 This shed has been constructed with security in mind, but you will need to buy a padlock if you want to keep your storage completely safe. Shed Store do give you the option to buy a padlock with the shed so this is something we’d definitely recommend. The windowless design makes sure all of your storage is kept out of view which in turn doesn’t just boost privacy, but security too. 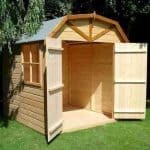 Though Shed Store don’t offer any customisation options, there are ways you can make this shed a little more unique. Two great examples are changing the colour of the shed and the roofing felt. Obviously its main benefit is the fact it doesn’t require annual treatments. Usually the best way to add a different look to a shed is to use coloured treatments. You could still do this, but we’d suggest using an outdoor paint instead. That way you can add any colour you like and it will really help to give this overlap building a more attractive design. A fibreglass roofing felt would also help you to not only alter the look of the shed, but also boost the roof’s longevity. 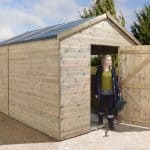 Again, Shed Store don’t provide these extras but you can easily find them online. What the company does offer is hooks, security alarms and a solar light. Now these are all pretty useful things to invest in. The hooks have been especially created with overlap buildings in mind. They just slot right into the overlap panels, enabling you to hang lightweight equipment and keeping the interior more organised. The security extras are something we highly recommend you add to your purchase. 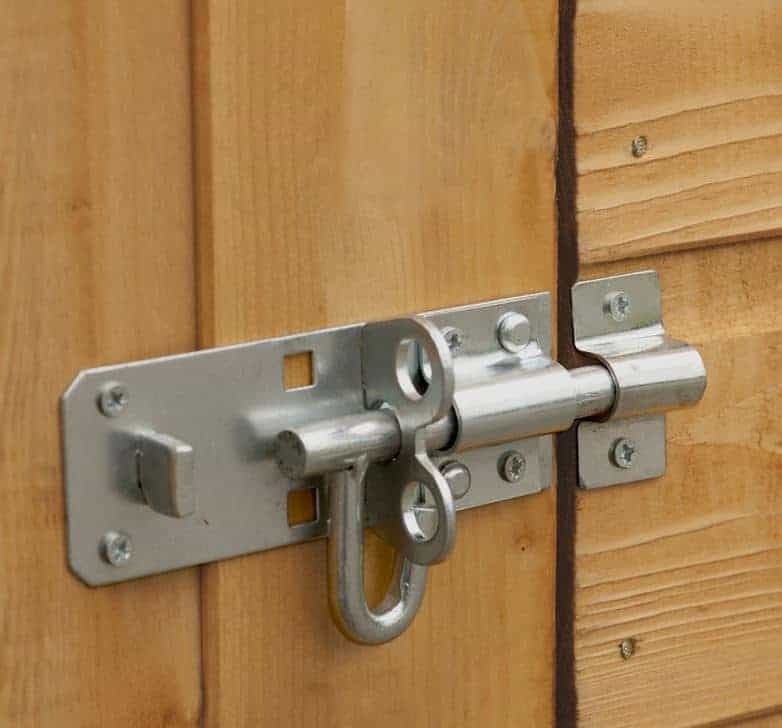 As the shed doesn’t come with a lock, you do need some form of security to keep your storage safe. There are two options available to you including a full alarm kit from Yale and an alarm padlock. Both are effective and the fact they contain an alarm offers a high level of security. The solar light is especially useful on this shed as it doesn’t come with windows. So if you’re planning on using it to work in, the solar light will ensure you can see what you’re doing. It charges up throughout the day via a solar panel and is one of the most cost effective shed lights available. Though some cost cutting measures have been introduced inside the shed, overall the quality, especially for the price, is outstanding. This truly is a remarkable shed that offers incredible longevity. Overlap sheds rarely require zero maintenance so the fact you do not have to treat this model is a fantastic benefit. It comes with a 15 year warranty too to highlight its exceptional durability. Being a large shed, you have a very spacious interior which allows you to store all kinds of furniture, equipment and tools. No matter how much outdoor stuff you need to store, you should find this model is more than capable of meeting your requirements. The instructions provided with the shed are reportedly easy to follow. However, it is going to take quite a few hours to put it together. According to Shed Store it will take anything from 3-5 hours. Some customers have stated it might be easier to use screws instead of nails in some parts of the construction. Overall though you should find it fairly simple to install. 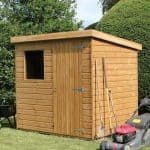 This shed offers remarkable value for money. It doesn’t need annual treatments and it offers a higher quality than the majority of other overlap sheds. Final Thoughts: We are very impressed by the quality and longevity of this shed. With overlap, whilst it does provide a good level of reliability, it isn’t known for its durability. It typically requires annual maintenance to ensure it lasts the full warranty. So the fact you don’t have to add even one treatment to this shed is fantastic. It also comes with a few additional benefits such as a windowless design, wide double doors, a pad bolt and a slightly stronger MFP floor. The 15 year anti rot guarantee is outstanding and ensures you are getting a high quality, durable building.